We admit it. We get to meet a lot of pretty cool people in this crazy world we have carved out for ourselves as the Pop Culture Passionistas. 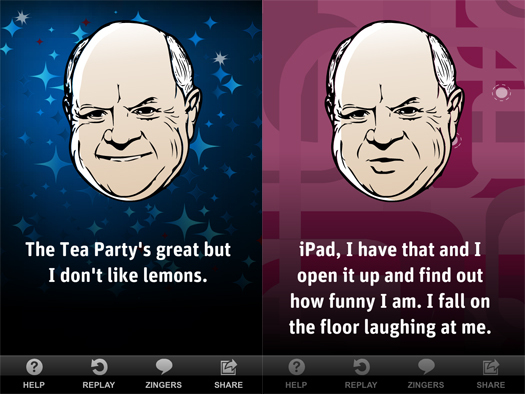 But one of the highlights so far has to be the opportunity we were recently given to help create an App for Don Rickles. The 85-year-old comedian is still working, still touring and still making people laugh and we were thrilled to be able to sit in a recording studio and watch his genius at work. The idea was simple. Don was provided with a list of topics, celebrities, ethnicities and more and he would rattle off whatever brilliant quips came to his mind. There was no script, there was no pre-planned agenda. Just 90 minutes of pure unadulterated comedic mastery. It was all off-the-cuff, new one-liners unheard by anyone. In a recent exclusive interview Mr. Rickles told us that is how he always works. "I don't call it material. It's all just Don Rickles being sarcastic. Everything I've ever done in my whole career, people might not know, I've never written anything down on paper. Everything has just happened to me on stage to this very day." He continued, "And so when I do these Apps and Tweets and stuff, it's just whatever comes to me. And if I think it's funny I write it down. So it's not a planned approach to each subject." "Donald Trump can't be here tonight. His comb broke." "Ryan Gosling. A handsome kid. Takes a shower and the water runs up." "The Tea Party's great but I don't like lemons." "Smartphones. Who cares? Smartphones. I only have dummy phones. 'Kiss my hockey puck.' Dummy phones." It's all classic Rickles. While many stand-ups have copped his approach to comedy, no one does it better than Don. After all, he invented the art form. He stated, "To my knowledge, I was the first guy really to do what I do. And then later on different comedians started trying doing it. It's not something you rehearse or try. In my belief, it's in your personality. I was always, even as a kid, in the service, I was always being the so-called 'wise guy' in fun. I always had that attitude and so that became my performance." And while he was influenced early on by some of the great comedians, he found his own style. "When I first started out, Milton Berle was my hero. As I grew to be a man and started to work on my own, I realized that his work was what he did, I respect that, but it was not something that I wound up doing. But his timing I was always impressed with... But I never picked up anybody's style except my own." Don’t miss his inimitable style. Download the Don Rickles Mr. Warmth App for iPhone and Android. It's just $2.99 and worth every penny. Oaky, maybe we're a little biased, but we wouldn’t steer you wrong. And be sure to tune in to see Don demonstrate the App on The Jimmy Kimmel Show on March 21.